The heart wants what it wants and for Ritual Dyes founder and yarn-slanger Rachel Batcher, one day that came to mean one thing: The perfect, end-all vessel with with to tote and work on projects on the fly. So, she got out her sketch pad and got to work on the Knitter’s Backpack. The design itself takes various on-the-go knitting stances into account: sitting, sure, but also walking and leaning (like, if you’re on the bus or train, for instance). The ingenius strap mechanism can sit on your back one moment, then slip through to rest on your forearm the next. 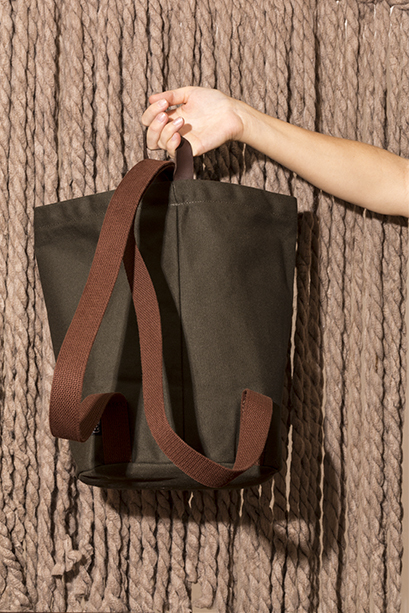 It’s open at the top so your yarn can keep on flowing, but, made in structured and waxed duck canvas and leather, it’s structured enough that your stuff won’t spill out.